Champions Grille: Always Great Beer on Tap!! Always Great Beer on Tap!! "Get In The Game!” at Champions Grille, Cincinnati’s best westside sports bar. You'll feel like you’re in the middle of all the sporting action while sitting at our large bar. Watch your teams on our 19 HI DEF TVs. Catch all of the football games this fall and winter on the NFL Sunday Ticket, Big Ten Network and SEC Network. Baseball season is always in full swing at Champions with the MLB Extra Innings Package. Champions also features The Golf Channel so our fans can keep up with action. 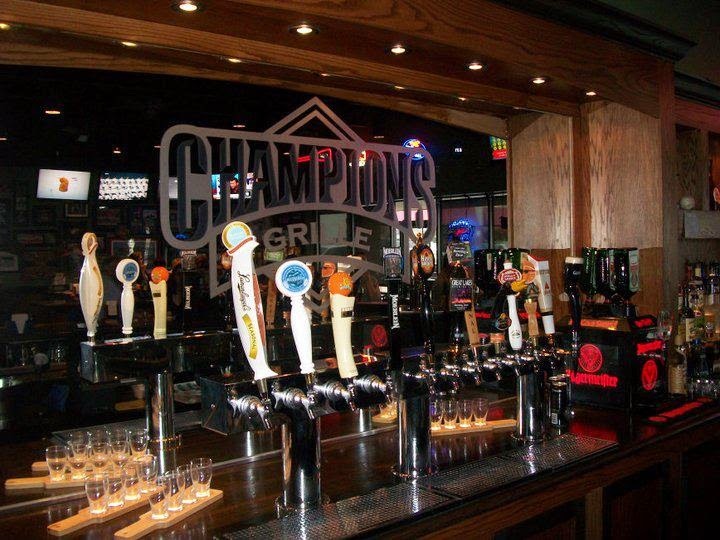 Champions Grille has a large selection of draft and craft beer with 18 varieties on tap. Join us for Happy Hour EVERY DAY from 12-7. Champions menu includes our unique Build a Burger menu to allow our fans to make their burger their own way! Without a doubt, this makes Champions THE best place to watch your favorite game or sports activity. Catch all of the action at Champions!